On New Year’s Day, 1888, Elias Disney and Flora Call were married. Over the next five years they added three sons to their family: Herbert in 1888, Raymond in 1890, and Roy in 1893. By the time Flora became pregnant again some eight years later, the couple were living in Chicago, where Elias was making a living as a carpenter and builder. 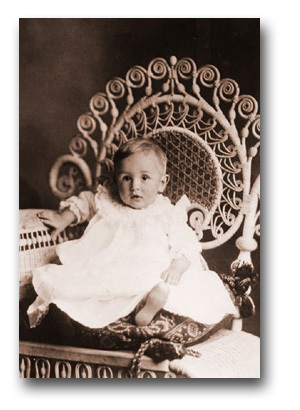 On December 5, 1901, a fourth child, Walter Elias Disney, was born, named after the family’s pastor. (The pastor, in turn, named his son Elias, after Walt’s father.) Two years later a little girl, Ruth, arrived and the Disney family was complete. But Elias and Flora were unsettled by the raucous, saloon-centered nature of their neighborhood. When two boys in the neighborhood were arrested after killing a policeman, that was the last straw. Walt and Ruth, as the babies of the family, had few tasks on the farm, and those they had weren’t overly strenuous. Their memories of the farm were almost entirely favorable — with the possible exception of the time they got into deep trouble for doodling on the barn with black sticky tar. The same wasn’t true of his older brothers, who labored mightily to help Elias squeeze a decent living out of the land. As Walt grew older, his universe expanded to the town, where he became friendly with a variety of interesting characters like Erastus Taylor, a Civil War veteran who told Walt a succession of dramatic tales of battles long past. Family members were ever present, including Grandma Disney and Uncle Mike Disney, who was a railroad engineer. Uncle Mike would come roaring into town behind the throttle of a giant locomotive, carrying striped bags of candy for the children. Aunt Margaret, Uncle Robert’s wife, “would bring me big tablets — Crayola things — and I’d always draw Aunt Margaret pictures and she’d always rave over them,” Walt later recalled.